Although feedback control and automation has revolutionized many fields of human activity, it has yet to have a significant impact on healthcare, particularly when a patient is in the loop. Although there have been a number of studies concerned with closed-loop control of anesthesia, they have yet to have an impact on clinical practice. For such systems to be successful, engineers and clinicians have to work hand in hand, for this they have to have a basic understanding of each other’s fields. 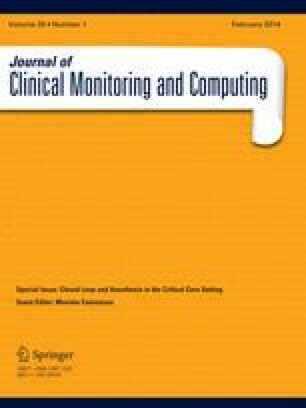 The goal of this paper is to introduce clinicians to basic concepts in control engineering, with an emphasis on the properties of feedback control. Concepts such as modelling for control, feedback and uncertainty, robustness, feedback controller such as proportional-integral-derivative control, predictive control and adaptive control are briefly reviewed. Finally we discuss the safety issues around closed-loop control and discuss ways by which safe control can be guaranteed. Samad T, Annasamy AM. The impact of control technology. IEEE Control Systems Society. 2011. Available at: http://ieeecss.org/main/IoCT-report. Accessed 15 Nov 2012.